Made by the Scottish instrument maker John Ramage of Aberdeen, this telescope had a focal length of 25 feet and speculum mirror of 15 inch diameter. It was brought to Greenwich by Ramage in the winter of 1825/6 and set up in the Observatory’s Courtyard. Observations were made from the platform at the front, looking down the tube at the mirror. At the time, the telescope shared the distinction of being the largest front view reflecting telescope in the UK after Herschel’s 40-foot instrument. Described by Airy in 1836 as useless, it was dismantled soon after. In the early 1800s, John Ramage, a merchant from Aberdeen began constructing Herschelian like telescopes. In 1817 he constructed a telescope of 20 feet focal length, with a speculum mirror of 13½ inches in diameter and in 1820, one of 25 feet focal length, with a mirror of 15 inches. 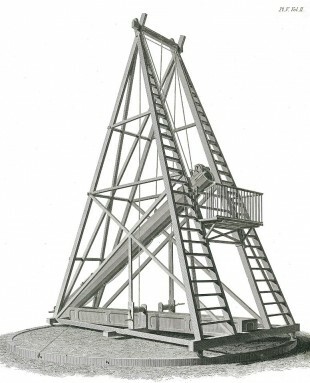 By 1825, he had made two further 25 foot telescopes with 15 inch mirrors. One of the three 25 foot telescopes was sent to Greenwich. Another was in the possession of Captain Ross, the arctic navigator, at Stranraer. One is also said to have been acquired by Dr. Dauney, a professor of Law and set up at Broadford near Aberdeen. In 1823, Ramage also made a 21 inch mirror of 54 feet focal length, which was still without a mount in 1825. Quite how good or bad the telescope was is difficult to judge, for although initially embraced by Pond, his enthusiasm soon began to wane perhaps possibly because of the deficiencies of the telescope, but just as likely because of the Observatory’s increased workload as a result of obtaining a second mural circle. The only observations with the telescope to be published in Greenwich Observations, seem to have been of the emersion of Saturn from behind the Moon which was observed on 16 Feb 1826 and of the immersion of the second satellite of Jupiter which was observed on 26 February 1826. Click here to view these observations as originally published. Had such a plan existed, it was certainly put paid to by Airy’s arrival as Astronomer Royal on 1 October 1835 and Ramage’s untimely death a few weeks later on 26 December. But was their any truth in Pearson’s assertion? The Minutes of the Board of Visitors from 1860 (ADM190/4/299) suggest there may have been. They carry the following entry: ‘The 2 feet speculum belonging to Ramage's telescope has been sent to the representatives of Mr. Ramage.’ ... But what was this 2 feet speculum and when did it come to Greenwich? Was it the 21 inch speculum of the 50 foot telescope or perhaps even the 15 inch speculum from the 25 foot telescope ... or was it truly a speculum of 2 feet ... and if so, what was its focal length? Exactly when the 25-foot telescope was dismantled at Greenwich is not clear. Still present in 1836, Airy clearly wanted to be rid of it. Ramage however was now dead, so couldn’t be summoned to take it away. It was probably taken down in 1836 and certainly by early 1839 as it does not appear in Elizabeth Smith’s drawing of the courtyard. Whether it was put into storage at Greenwich or sent elsewhere is uncertain. In 1840, John Campbell, 2nd Marquess of Breadalbane, and Rector of the University of Glasgow acquired two Ramage telescopes for the University’s Horselethill Observatory which was founded that year. 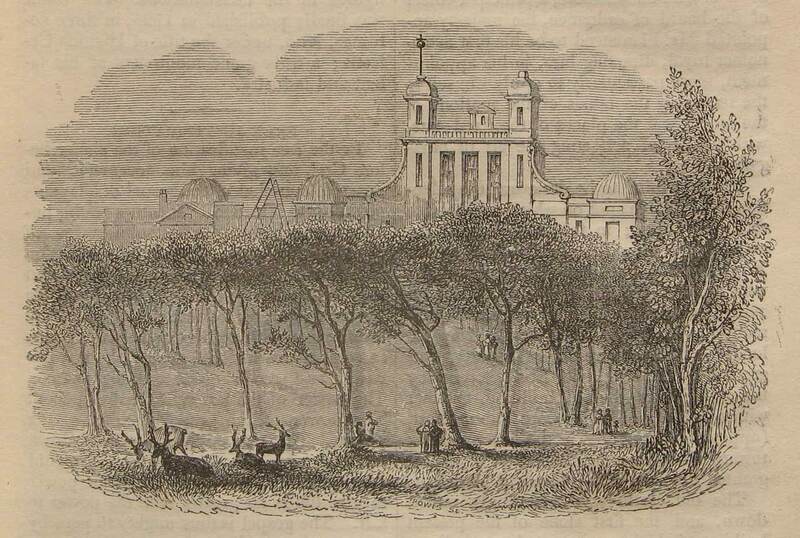 In an account of the observatory’s erection given at the Glasgow meeting of the British Association for the Advancement of Science in August 1840 (click here to view), one is described as being of 25 foot focal length, the other as 55 feet and 23 inches in diameter. Some believe the 25-foot instrument was the one that had been at Greenwich. What is said to be a finderscope from the 25-foot telescope was presented to the Astronomer Royal, Richard Woolley, in 1967 and is now in the care of the National Maritime Museum (Object ID: AST0921). The two accounts below both have the same plates. They were drawn and engraved at the joint expense of the [Royal] Astronomical Society of London and Pearson. Both accounts give a full description of the telescope’s mode of construction and operation. Ramage’s Obituary. From Monthly Notices of the Royal Astronomical Society, Vol. 4, p.37 (1837).